Eeks! | An alien voice under a duvet of dreams. Oh crap, I’ve got to have failed! I couldn’t have failed, I did OK on the TMAs. Don’t be stupid, of course you’ve failed! No, I haven’t failed. And I’d be happy with a pass 2. 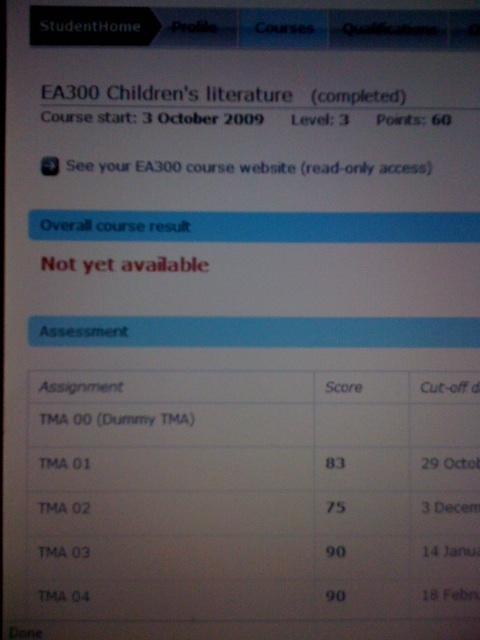 You really wouldn’t be happy with a pass 2, not with those TMA results! Actually, I’ll be happy just to pass. Please, just don’t say I’ve flunked it! Thanks. Just hope I haven’t done my usual of shooting myself in the foot when it comes to the exam.